Papers in this volume reveal new and improved technologies for nonferrous materials extraction and processing. Symposia highlighted from the Sohn International Symposium include nonferrous high temperature processing; materials processing; and nano, ceramic and composite materials processing. From the <a href="[external URL] target="—blank">2006 TMS Fall Extraction & Processing: Sohn International Symposium, held August 27 – 31, 2006, in San Diego, California. 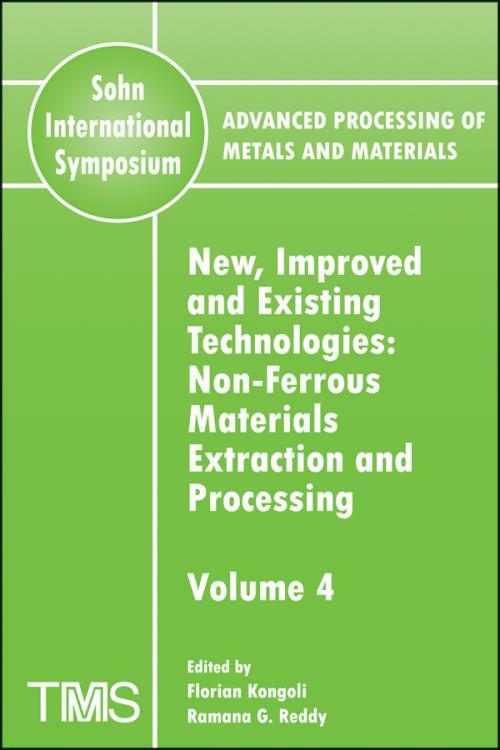 VOLUME 4: NEW, IMPROVED AND EXISTING TECHNOLOGIES: NON–FERROUS MATERIALS EXTRACTION AND PROCESSING. Aluminum Extraction in Ionic Liquids at Low Temperature (Keynote) (V. Kamavaram, and R.G. Reddy). A Comparison of Conventional Copper Anode Furnaces with the New Elliptical Anode Furnace Concept (M. Potesser, H. Antrekowitsch, H. Rinnhofer, and U. Zulehner). Development and Creation of Modern Metallurgical Technology for Antimony Production with Gold Recovery from Domestic Gold–Antimony Concentrates in Russia (Invited) (F.A. Myzenkov, and A.V. Tarasov). Developments with the Imperial Smelting Process (Invited) (R.W. Lee). Furnace Cooling Technology in Pyrometallurgical Processes (Keynote) (K. Verscheure, A.K. Kyllo, A. Filzwieser, B. Blanpain, and P. Wollants). Production of Scandium and Al–Sc Alloy by Metallothermic Reduction (Invited) (M. Harata, T. Nakamura, H. Yakushiji, and T.H. Okabe). Inducarb A New Reducing Facility for Various Oxidic Melts (A. Jürgen, O. Dieter, and E. Alfred). Kinetics Study of a Decomposition Reaction by Gas Chromatography (D. Quattrini, J.P. Gaviría, G. Fouga, A.E. Bohé, and D. Pasquevich). Microwave Sintering, Brazing and Melting of Metallic Materials (Keynote) (D. Agrawal). Effect of CaSO4 Pelletization Conditions on Pellet Strength and Reactivity for Converting SO2 to Elemental Sulfur by Reaction Cycles Involving CaSO4/CaS (M.E. Choi, H.Y. Sohn, Y.M.Z. Ahmed, F.M. Mohamed, G. Han, and M.E.H. Shalabi). New Technology for the Treatment of Molybdenum Sulfide Concentrates (K.Y. Hakobyan, H.Y. Sohn, A.V. Tarasov, P.A. Kovgan, A.K. Hakobyan, V.A. Briovkvine, V.G. Leontiev, and O.I. Tsybine). Processing of Lead–Zinc Raw Materials (A.V. Tarasov, and A.D. Besser). Pilot Scale Solar Carbothermic Reduction of ZnO to Zn (Keynote) (C. Wieckert, M. Epstein, G. Olalde, S. SantTn, and A. Steinfeld). Aluminum Extraction Via Batch Recirculation Electrolysis in Ionic Liquids (Invited) (M. Zhang, and R.G. Reddy). Processing Complex Copper Matte by Using Pig–Iron (L. Voisin, K. Itagaki, A. Moyano, and J. Font). Modeling of Mold Filling of Aluminum Casting (Keynote) (K.P. Nishad, and A.K. Singh). Non–Ferrous and Precious Metals Extraction from Complex Sulfide Concentrates by Pyrometallurgical Processing (Abstract Only) (N. Mitevska, L. Misic, and J. Marinkovic). Solid Oxide Membrane (SOM) Technology for Environmentally Sound Production of Titanium (Keynote) (M. Suput, R. DeLucas, S. Pati, G. Ye, U. Pal, and A.C. Powell IV). Modeling of Magnesium Extraction from Magnesium Oxide by SOM Process (R. DeLucas, G. Ye, M. Suput, and U. Pal). Removal of Lead and Antimony from Liquid Copper by Cu2O or CuCl–Based Fluxes between 1423 K and 1573 K (Y. Cui, X.–H. Du, H. Matsuura, T. Hamano, and F. Tsukihashi). Slag Solidification with Water–Cooled Probe Technique (M. Campforts, K. Verscheure, F. Verhaeghe, T. Van Rompaey, E. Boydens, B. Blanpain, and P. Wollants). The Extractive Metallurgy of Beryllium: Current and Future Technologies (Keynote) (Abstract Only) (E. Vidal, and D. Kaczynski). Development of Optimized Process for Recovery of Heavy Minerals from Korean Beach Sand (W. Kim, H. Shin, and J. Lee). Processing of Man–Made Raw Materials as a Significant Source of Resources and One of the Main Ways for Development of the Russian Nonferrous Metals Industry (A.V. Tarasov, and A.D. Besser). Autoclave Processes for Mineral Processing (E.M. Timoshenko, and A.V. Tarasov). Innovative Prospects for Nonferrous Metals Production in Russia (Keynote) (A.V. Tarasov). Effect of Formation Age on the Manufacturing Process of Aragonite Precipitated Calcium Carbonate (J.–W. Ahn, J.–A. Kim, J.–H. Kim, and H. Kim). Effect of the Hydration Condition on the Synthesis Characteristics of Aragonite–Precipitated Calcium Carbonate (J.–A. Kim, J.–W. Ahn, and J.–H. Kim). Production of Rare Earth Ferrosilicide Alloy (Y.A. Topkaya, A. Geveci, and O. Turgay). Thermoconcentration of Pyrrhotite Concentrate (Invited) (L.N. Ertzeva, L.Sh. Tzemekhman, and V.T. Diachenko). Energy Consumption Improvement in Submerged Electric Furnaces for Ferrochromium Production (Invited) (N. Lohja, R. Domi, A. Bernardi, M. Appolonia, F. Abatti, I. McBow, R. Budd, and F. Kongoli). New Flowsheet of Sulfur Production from Sulfide Ore Autogenous Smelting Off–Gases (O.I. Platonov, A.G. Ryabko, L.Sh. Tsemekhman, and Yu.V. Vasilyev). Production and Processes of Sodium Pyroantimonate in China (T.–z. Yang, M.–x. Jiang, Z.–f. Xie, and W.–f. Liu). Recent Development in Sonoprocessing of Materials (Invited) (M. Kuwabara, J. Yang, and T. Kubo). Elaboration of Iron Based Hydrogen Accumulating Alloys (V. Kopaleishvili, I. Kashakashvili, L. Kereselidze, N. Khidasheli, D. Kopaleishvili, and K. Ananiashvily). Molecule Polarization State for Refractive Indices Material Compensation Film Thickness (C.–F. Chang, C.–H. Chan, and Z.–N. Wan). Advances in the Ferrous Powder Metallurgy (Invited) (K.S. Narasimhan). Energy Reduction in Ore Comminution Through Microwave (Invited) (A. Kumar, V.V. Ramaro, B.P. Kamath, K.P. Ray, and K.R. Kini). Some Aspects of Duplex PACVD Hard Coating onto Tools for a Hot–Work Application (V. Leskovsek, M. Jenko, and B. Podgornik). Hydrogen–Absorption Properties of Rare Earth – Transition Metal Compounds (T. Tanabe, J. Kadono, and S. Yamamoto). Structural and Electrochemical Properties of Layered LiMn0.5Ni0.3Co0.2O2 Positive Material Synthesized by Co–Precipitation Method (Y. Chen, and B. Chen). Synthesis of MmNi5 by Combined Mechanical Alloying –Low Temperature Heating Process (M.R. Esquivel, J.J.A. Gamboa, F.C. Gennari, and G. Meyer). Microscopic Morphological Compensation Film Thickness for Phase–Separated Composite Film (C.–F. Chang, Y.–C. Chan, and Z.–N. Wan). Phenomenological Quasielastic Optimization Simulation for Phenomenal Isotropic Medium Liquid Crystal (C.–F. Chang, W.–C. Chen, and Z.–N. Win). MATERIALS PROCESSING II: NANO, CERAMIC AND COMPOSITE MATERIALS. Antibacterial Evaluation of Carbon–Ceramic Composites (Keynote) (O. Yamamoto, and Z. Nakagawa). Synthesis of Metal Oxide Nanoparticles by Flame Spray Pyrolysis (Invited) (H.D. Jang, H. Chang, C.K. Lee, and Y.J. Suh). Synthesis, Structure and Performance Studies of LiFePO4–Based Cathode Materials for Li–Ion Battery (X. Dai, H.–h. Tang, C.–f. Zhang, and P. Yang). Chemical Vapor Synthesis of WC–Co Nanocomposite Powders (M. Mena, T. Ryu, H.Y. Sohn, G. Han, Y.–U. Kim, and Z.Z. Fang). Preparation of the Solution Containing Metal Nano–Particles and Its Characterization (T. Hayashi, T. Atsuki, R. Kiyoshima, M. Sugino, and O. Yamamoto). Durability of Two Extractants for Pd(II) Separation, Thiodiglycolamide and Di–n–Hexyl Sulfide: Against a Mixed Solution of HNO3 and HCl (H. Narita, M. Tanaka, and K. Morisaku). Advanced Technology for Manufacturing of Layered Composite Materials by the Method of Electro–Contact Heating Under Pressure (D. Nozadze, T. Namicheishvili, Z. Liluashvili, and D. Macharadze). Surface Material Compensation Film Thickness for Phase Separated Composite Film (C.–F. Chang, W.–C. Chen, and Z.–N. Win).